Special Bonuses: Luxembourg City will start as a neutral (3) and whoever conquers it gets +1. Impassable Objects: Since this is a very small map I was thinking that I should not include any impassable objects to make the gameplay fast. I have added some textures to the bordering states and put up a poll. I kept the textures subtle on purpose because I don't want to affect the simplicity of the map or detract the attention from Luxembourg itself. Version 1.8 - New mini map, refined coat of arms, changed territory name, added flag to mini map. 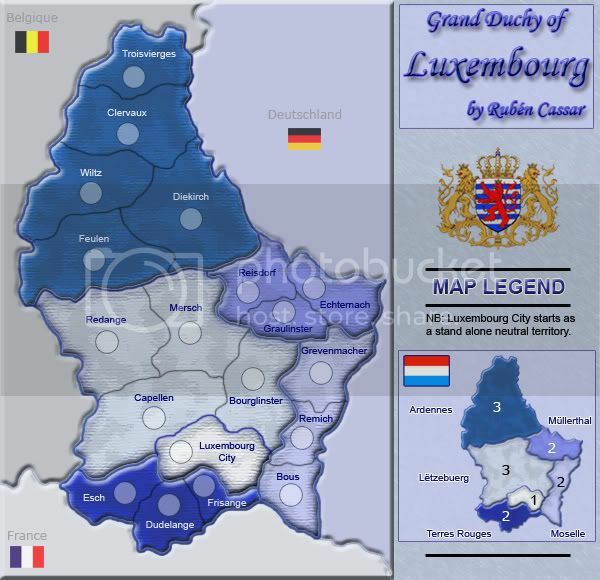 I want to make a Luxembourg map. However I was thinking of keeping the territory number low. I was thinking 18 like Doodle Earth. I remember I was very sceptical when Doodle Earth was being made and I objected against such a low number of territories, however it seems to be very popular and the concept seems to have worked. Is there demand for a map with 18 territories for quick games and 1vs1? Give me your feedback and I'll decide if this is the way to go for this map. Last edited by Ruben Cassar on Tue Jun 24, 2008 6:09 pm, edited 45 times in total. Although, can you get enough territories out of it? I think it will be great, I love your maps! Last edited by t-o-m on Sun Oct 20, 2013 3:38 pm, edited 1 time in total. I love small territ maps. I think we need another 18 count. I think when the 8-player update was added, the request was for more larger territ count maps, to allow for fair 8 player games. But I'm ready for another good small map. You know you have my support on this. What would you use as impassables? Roads? 'Cause, you know, mountains are out of the question -- seeing as any one mountain is bigger than the entire country! InkL0sed wrote: What would you use as impassables? Roads? 'Cause, you know, mountains are out of the question -- seeing as any one mountain is bigger than the entire country! maybe try parks, monements, places to visit, tourist attractions, known buildings, anything of significance you could use? Hi guys. Glad to see some feedback and that people want the map. I already have a draft of the map broken in 18 territories. Actually I found a political map of Luxembourg or something like that which was broken into over 50 territories, so the real actual size of a nation has little to do with a playable map. I haven't thought about impassable objects yet but Luxembourg is full of rivers (or rivulets ) so that should not be a problem. I will be focusing on the San Marino map for the time being so this is kind of a long term project. I am not sure about chocolate. I think Belgium and the UK top that chart. What I am sure is that Luxembourg is by far the richest country on the planet on a per capita basis. Ruben Cassar wrote: What I am sure is that Luxembourg is by far the richest country on the planet on a per capita basis. I know Iceland is right up there as well. And isn't Notre Dame in Luxembourg as well? Iceland is rich but not that rich. You might be confusing Iceland with Norway. Norway is the 3rd largest producer of oil in the world and that has made it a very rich country with low unemployment. You might want to check the CIA Factbook (google it!) for some statistics. lol - ooops im not allowed to say that! i think that immpassible rivers would be good, are they in the right places?? i think it would be good in a sort of belgium style maybe, just a lil thought. would there be any gameplay features or just simple map? haha i didnt know that luxembourg was that big!! Good one Ruben...go for it. I was going to suggest this, I was born there and lived there for 5 years so I know alot about it, need any help let me know. Ok guys, just posted an update on page 1. Waiting for feedback and suggestions. is the colour scheme/pallet blue? also i dont like the way that youve got a big cont, really big compared to the rest, and then a really small one - will that work or not?? t-o-m wrote: is the colour scheme/pallet blue? The small one is Luxembourg City...the neutral. Regions are divided according to real life borders. Ruben Cassar wrote: The small one is Luxembourg City...the neutral. Regions are divided according to real life borders. is luxembourg city a cont. or a terit? Make it more of a king theme, its the only place left that still has a Grand Duke. Luxembourg is a country. Luxembourg City is its capital. Luxembourg City is that white territory that will start as neutral and have a +1 bonus. P.S. I am working on the bordering countries. Unit_2 wrote: Make it more of a king theme, its the only place left that still has a Grand Duke. Elaborate more please...what do you mean by king theme? Hmm, I don't think I want to take that approach. Besides what do those things mean anyway? Gold? Crowns? What use can they be on the map and what do they have to do with Luxembourg? Ruben Cassar wrote: Besides what do those things mean anyway? Gold? Crowns? 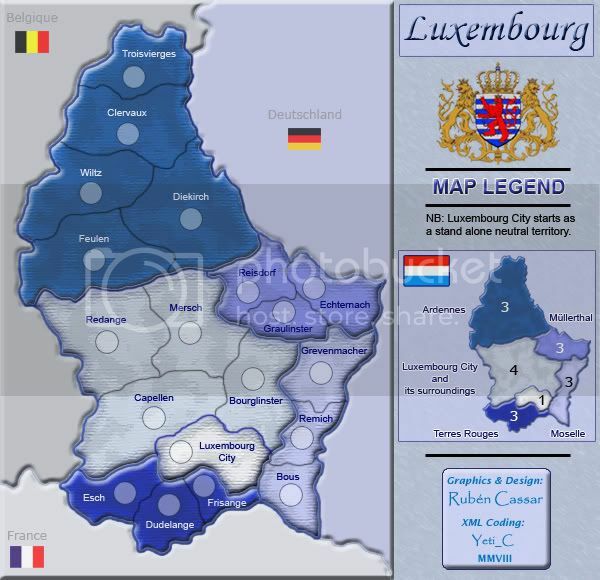 What use can they be on the map and what do they have to do with Luxembourg? I agree with you completely here. Those things are unnecessary clutter on the map. I think that the graphics on this should be clean and simple. The fact that this map has so few territories is great; I sometimes get sick of playing Doodle Earth, so another tiny map would be nice as an alternative. I can't wait to see the next version! Yes, that's what I had in mind. To keep it clean and simple. I added the neutral territory to spice it up a bit but that's it. Okay guys I added another updated with the countries surrounding Luxembourg, the territorial borders and the mini map with bonuses. Check them out on page 1.